Acting Prime Minister Mahmoud Jibril announced the death, saying it was the moment Libya was waiting for. Mr Jibril gave few details of how Col Gaddafi died, but video footage emerged showing him captured alive. Other images apparently showed him being dragged through the streets. Some fighters claim to have shot him, though it is not clear when he died. US President Barack Obama said it was a “momentous day” for Libya, now that tyranny had fallen. He said Libya had a “long and winding road towards full democracy”, but the US and other countries would stand behind Tripoli. Acting Justice Minister Mohammad al-Alagi told the AP news agency Saif al-Islam had been captured and taken to hospital with a leg wound; other officials said Mutassim had been killed in battle on Thursday. Golden gunNato, which has been running a bombing campaign in Libya for months, said it had carried out an air strike earlier on Thursday. Tripoli’s myriad of streets in various districts has been gridlocked for hours. People and fighters manning checkpoints shouted out “God is Great”, as some distributed mints and biscuits – later dubbed “revolutionary treats” – to passing cars. There are many who will be wondering “what next?” for Libya as it embarks on a new era unobtainable for almost half a century. 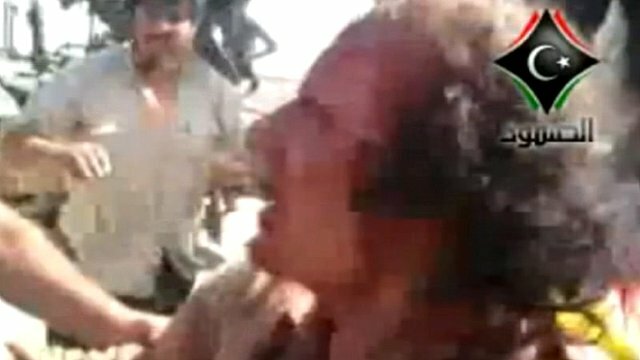 Proof of Col Gaddafi’s fate came in grainy pieces of video, first circulated among fighters, and then broadcast by international news channels. Some channels picked up footage they said showed the colonel’s body being dragged through the streets. Some fighters loyal to the National Transitional Council (NTC) said the colonel was shot when he tried to escape. One NTC fighter told the BBC that he found Col Gaddafi hiding in a hole in Sirte, and the former leader had begged him not to shoot. Mr Jibril held a news conference in Tripoli to confirm the colonel’s death. “We have been waiting for this moment for a long time. Muammar Gaddafi has been killed,” he said. Mr Jibril promised that NTC chief Mustafa Abdul Jalil would give more details of how Col Gaddafi was killed later. He also said Mr Abdul Jalil would officially announce the “liberation of the country”, allowing the NTC to begin pushing through democratic reforms that will lead to elections. “I think it’s for the Libyans to realise that it’s time to start a new Libya, a united Libya, one people, one future,” Mr Jibril said. ‘United Libya’Libyans gathered in towns and cities across the country to celebrate the reports of the colonel’s death. UK Prime Minister David Cameron, who had taken a leading role in Nato’s intervention, said it was “a day to remember all of Col Gaddafi’s victims”. Wacha tu, the African King was killed, so those who are clinching to power by all means like M7, should watch out. It a sad day for the continent, he had his bad side but look at the communication sector, who paid for the satelite to be sent to space to enable after to have connections to the world without paying the proxys. He liberated African from European dependency, no wonder their economy was weakening.